The OfficePro-46Ei 4:1 Pitch Electric Coil Binding Machine by Tamerica will help you stay on top of all your plastic coil binding tasks. The OfficePro-46Ei offers electric paper punching up to 20 sheets (20#) and a binding capacity of 450 sheets. With 46 disengageable pins, this unit makes punching quick and easy in a .250 punch pattern. Both punching and binding in the OfficePro-46Ei, makes your life easier and reduces fatigue. The OfficePro-46Ei has a relatively compact footprint, perfect for fitting into the tight spaces of any office environment. Discover how the Tamerica OfficePro-46Ei 4:1 Pitch Electric Coil Binding Machine can help improve productivity and your bottom line, today. Electric punch via top mounted button. Electric Coil Inserter w/Foot Pedal Operation. Punches up to 20 sheets per lift (20 lbs paper). Disengageable Dies with Dust Protector. Shipping Dims 22" x 15" x 13". Machine Dimensions: 18.1" x 11" x 9"
The electric punch and coil spinner make this machine really easy to use. I just wish I didn't have to crimp the ends of the coil. Excellent product, timely fulfillment and best price! Review by Kriss J. We are very please with our order from start to finish. We priced several machines and www.mybinding.com was the most economical. Once the order was placed we received it within one week. Machine works great! We are very happy. Teacher Review by Cross S.
Our binding machine is excellent and works like a pro. The instructions on how to use it was very simple. 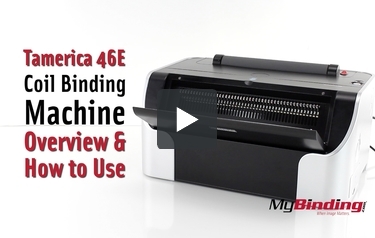 Transcript: The Tamerica 46E is one of our most popular binding machines that we sell. It has a sleek design and it’s fully electric, so it’s easy to see why. Before you start any project, you will want do a test page. If you are using letter sized paper, all you have to do is center the page and align the edge guides to both edges. In this position it should be perfectly aligned for this size. The Tamerica 46E is one of our most popular binding machines that we sell. It has a sleek design and it’s fully electric, so it’s easy to see why. If it’s not, or you are using a different size, use the left edge guide and roughly align it with the lines. Now punch your test page. If your holes are incomplete or not centered, continue to adjust the edge guide, or pull out any pins to disengage the individual hole. You can see that the 3 I pulled out were not punched in this example. You can also change the depth of margin. This is helpful for when you are using small coil for a thinner book, or larger coil with many pages—there are four depths to use. From time to time you’ll also want to empty out the waste tray, and slide it back in. Alright, now I’ll show you how to make a full book. Always start by punching your front and back cover with the proper alignment. Next, punch your pages—up to 20 sheets at a time. If the machine struggles to punch, take out a few less pages at a time while you continue to punch the rest. When finished, put the covers on on the book, then take your coil and spin it through about 4 holes by hand. You can start the coil inserter by pushing this red switch, or more conveniently use the foot pedal to activate it. Place the coil against the roller and it will spin through, leaving you with coil extending past both ends. Next, finish off the book using the provided coil cutting crimpers. Make sure the dot is facing up when you do this. Then firmly cut and crimp off the ends as seen here. You now have a book that lays flat and back to back—made fairly effortlessly using the Tamerica 46E Binding Machine. Tamerica is releasing new binding machines this spring and some of them are simply terrific. Their coil binding device, the OfficePro-46E, is one of the best for many reasons. It's packed with great features that are user-friendly and make it a pleasure to use. Let's take a look at this device's numerous strengths - and the one weakness that isn't really that big of a deal. The OfficePro-46E is like many of the other new machines from Tamerica in that it has a terrific punching capacity. The electric punch can handle up to 20 sheets at a time so you can start binding your documents in very little time. This machine has disengageable dies so it's possible to assemble both larger and smaller books. The maximum punching length is 11.7" which is ideal for letter- and A4-sized paper. There are 46 dies in total. This device has a built-in coil inserter so assembling your documents is really easy. You won't have to insert the coils manually which can take up a lot of time. Durability is an important feature to look for when selecting a coil binding machine. Luckily, the Office-46E is incredibly durable because it has metal parts. You can get a lot of use out of this machine and it should last a long time. One surprising thing about this device is that it's actually compact. It only measures about 18" x 11" x 19" so you could even place it on a desk if you want. That makes using it really convenient and it means you don't need to make a lot of room for it. Finally, the OfficePro-46E comes with a one-year warranty. You probably won't need to use it, but an excellent warranty is always nice to have. Color coils are available in sizes up to 50 millimeters and can bind work that's up to 440 pages long. However, the OfficePro-46E can only accommodate coils that are up to 25 mm thick. That means your work can only contain up to 220 pages. Keep that in mind if you produce a lot of lengthy documents. Although the Tamerica OfficePro-46E is only compatible with coils that are up to 25 mm thick, it's pretty amazing that it doesn't have any more weaknesses. In fact, this is one of the best coil binding machines currently available. The punching capacity is great, the machine has disengageable dies, and it's also really durable. The coil inserter is easy to use and the device won't take up too much room in your workspace. Even the warranty is good. All together, the OfficePro-45E is a terrific coil binding machine. Give it a try today to see how it can help you bind your important documents. What is the difference between the office pro 46e and office pro 46ei? Thank you for your question. The difference between the Tamerica OfficePro-46Ei and the Tamerica OfficePro-46E is the Ei comes with a foot pedal to operate the inserter. What shape is the hole that this machine punches? Thank you for your question. The Office Pro 46Ei punches a round 4mm hole. Is the page capacity 220 single sheets (440 pages two-sided)? or 110 sheets? Thank you for your question. This machine is capable of binding 450 individual sheets of 20# copy paper with a 2" coil. Thicker paper, coatings, laminates, etc will decrease the amount of paper able to be bound. My machine is starting to squeak when hole punching. Is there an oil or other type of maintenance that we should have done? Thank you! Thank you for your question. To address technical issues the best first step is to contact the manufacturers technical support department. The manufacturer is Tamerica and their phone number is 1(800)822-6555 . On the cover, can you printed images or name? Thank you for your question. We have a variety of printable cover stock available. We also have a wide variety of custom covers in several different styles. Our customer service department is ready to help make the perfect cover for you. Give them a call at 1-800-944-4573. What is the maximum width ? Thank you for your question. The maximum punching width for the Tamerica OfficePro-46E is 11.7" (A4) . Does it come with coil crimpers? Tamerica confirmed that the OfficePro-46E 4:1 Pitch Coil Binding Machine does come with crimping pliers so you would not have to purchase separately. Do you carry supplies for this machine? You can find the 4:1 coils for the OfficePro46 on our site. We have more than fifty colors and almost thirty different sizes.